More Local Ventures, Hawaii’s hit business show, moves to prime time on KFVE, Sundays every week at 6:30pm beginning June 26, 2011. More Local Ventures profiles local businesses and entrepreneurs who are transforming Hawaii in extraordinary ways. From high technology and biotech startups to third generation mom and pop shops, restaurants, boutique organic farms, non-profit organizations, and green companies. Businesses that succeed in the current economy do so in a market that resembles no other. More Local Ventures will also be simulcast on the web at pacificnetwork.tv where viewers are invited to interact and comment using a variety of social media platforms. Linking Hawaiian communities around the world, Pacific Network is an internet television portal streaming free to the world — island sports, travel, family, arts, culture, entertainment and more. 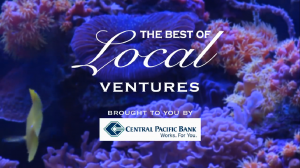 Sponsored by Central Pacific Bank, More Local Ventures supports local business and the spirit of entrepreneurship. To learn more about Pacific Network and More Local Ventures, please visit www.localventures.tv.